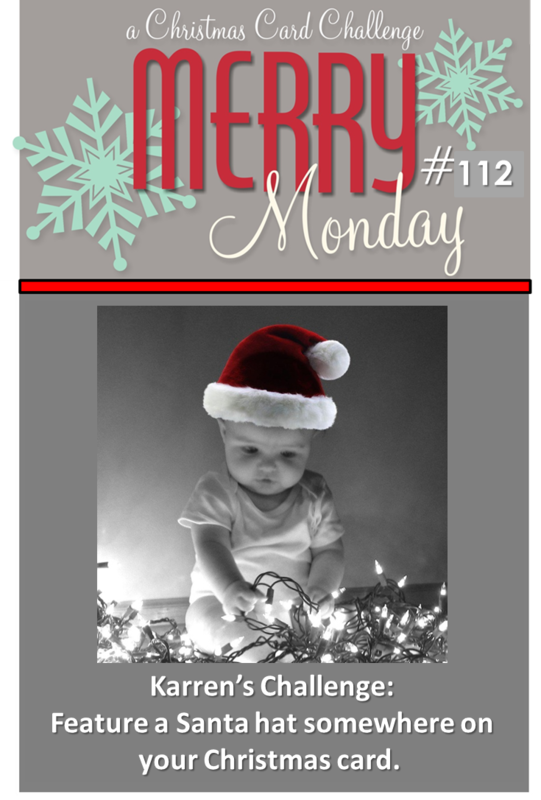 Hey Hey it Monday, that means we have a new Merry Monday Christmas Card Challenge for you. 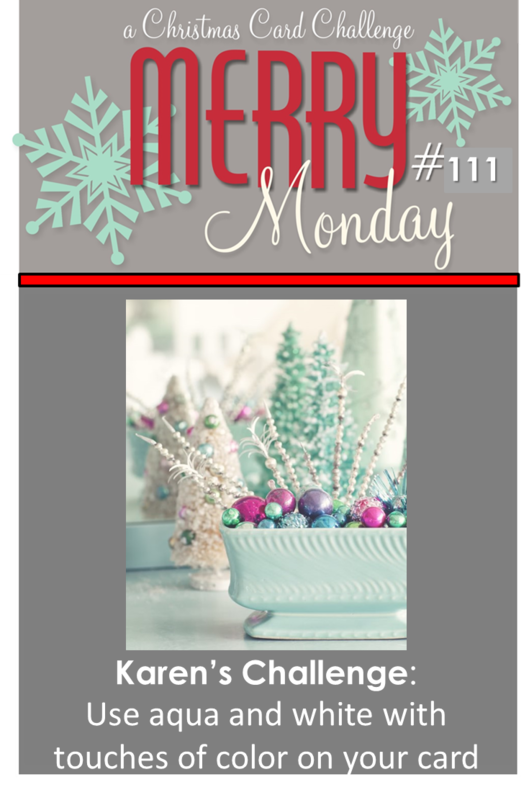 This week Kristie is challenging us to Create an all white Christmas card we can use silver for the sentiment. I went with clean and simple for my card.. that and lots of foam tape. 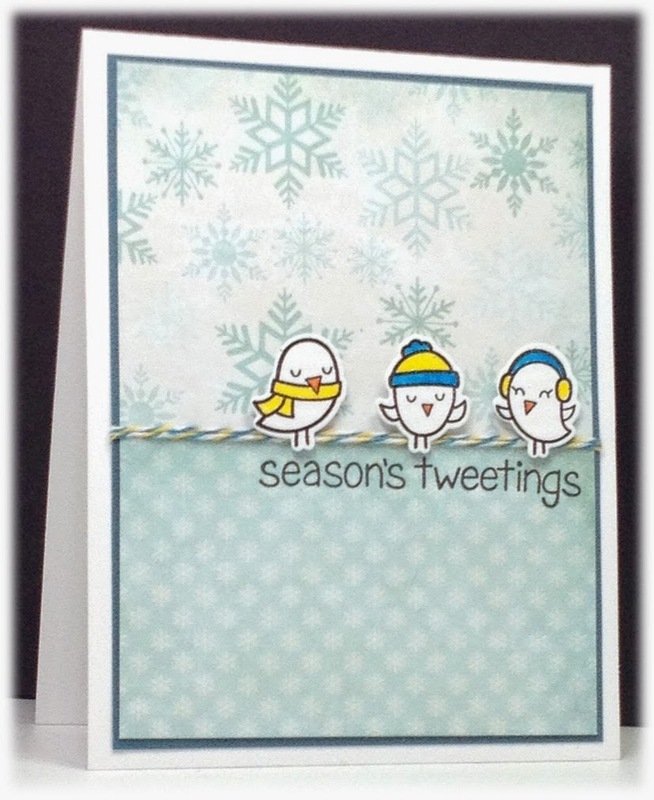 I stamped the sentiment first (in silver J) then I used a embossing folder for the falling snow. I used a Memory Box die cut for the cityscape. I popped up each layer to give the illusion of shadows and depth. 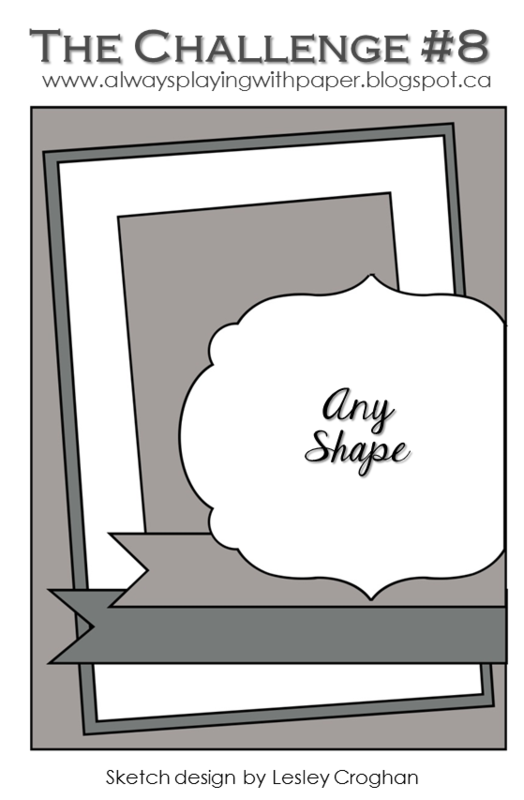 Supplies: White card stock, Memory Box die cut, embossing folder. 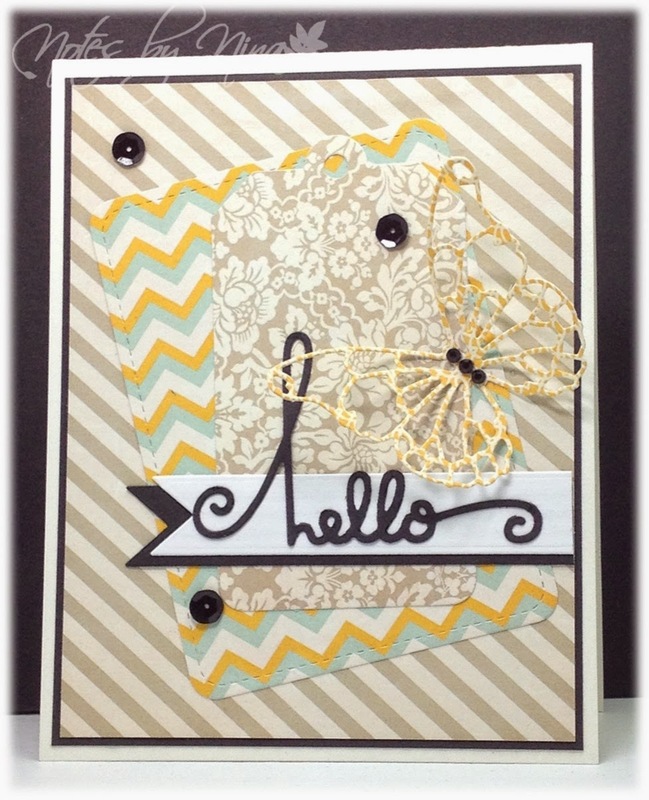 Stop by the Merry Monday Card Challenge blog and take a look at all the great creations by the design team, and perhaps play along. I put together a quick CAS card for the current Be Inspired Challenge. I am still playing with the Prima papers, I used the colours and polkadots from the inspiration photo as my guide for this challenge. I fussy cut this cute little guy then popped him up with foam tape and added a couple of black pearls for the eyes. I finished with some twine and sequins. Supplies: White cardstock, Designer Paper - Prima, The Alley Way Stamps - Birds of a Feather, twine, pearls, sequins. I had another little pocket of time to craft this evening. I used the current sketch from Tuesday Morning Sketches as my inspiration. I finally dug into my Simon Says June Kit, I love this pretty vellum. I used a Lawn Fawn die cut and added some fussy cut flowers as my shape. I finished with a tiny sentiment and some gems. 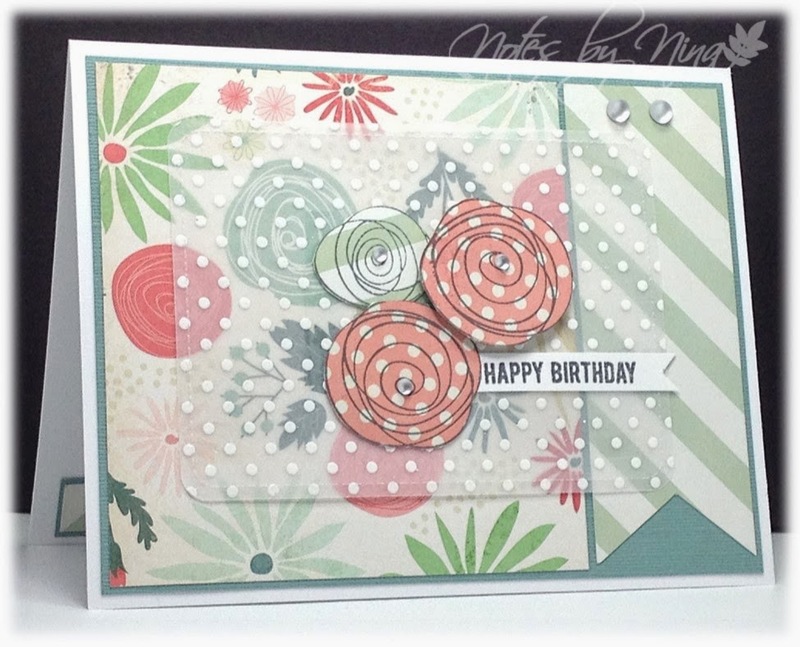 Supplies: White and aqua card stock, Vellum, Designer Paper – Prima, Simon Says – Favorite Flowers, Sweet Stamp Shop-Happy Birthday, Lawn Fawn die cut, gems. A quick post for this evening, I wanted to play along with the current sketch for The Challenge over at Always Playing with Paper. My anniversary is coming up in the near future and of course I needed a card, we will be celebrating while in Las Vegas so I wanted a light hearted style card. 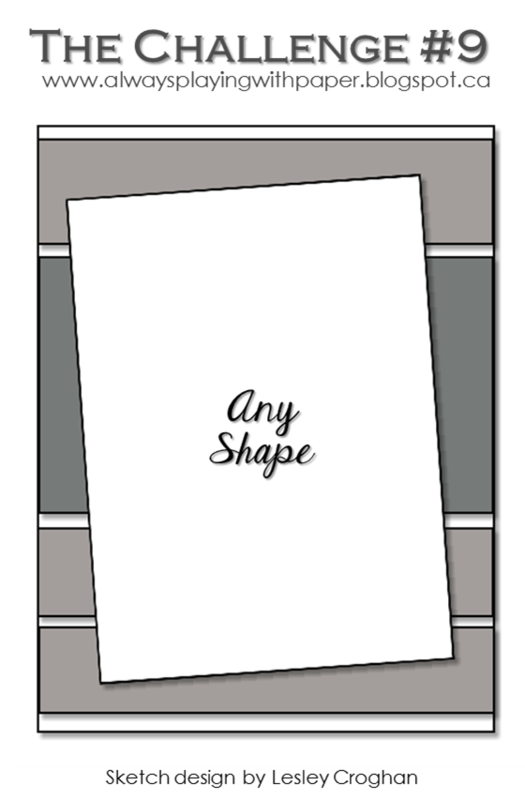 Supplies: White and slate cardstock, Designer Paper – Echo Park, Lawn Fawn and Spellbinders die cuts. It is time for a new Merry Monday Christmas Card Challenge. 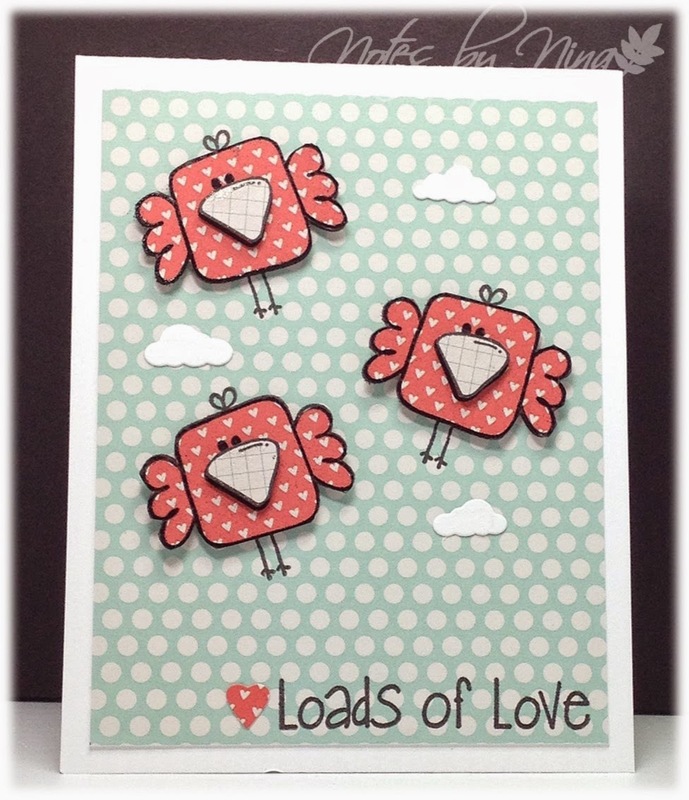 This week Katie has chosen the challenge: Use Sparkle, Shimmer or shine on your card. 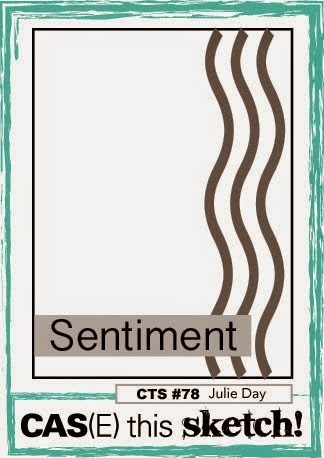 I when with a simple style card, I stamped the sentiment and trees then used a matching die cut to create a layer. I embossed the background with a snow texture then covered both layers with a Frosted Crystal embossing powder, I love that it looks like glistening snow. I added the sequins to cover up a couple of dark spot that were picked up from my less than pristine Versamark pad. The first picture does not really show the embossing so I tried for a close up. 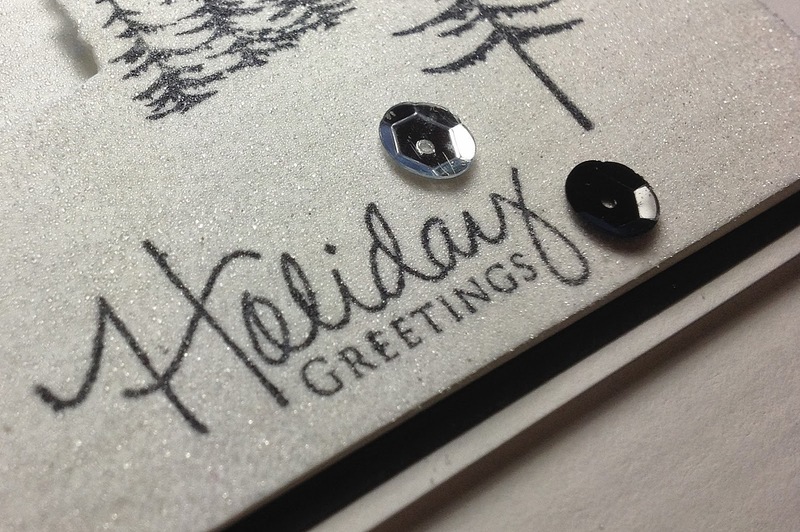 Supplies: White and black card stock, Poppy Stamps and die cuts, Antiquities Frosted Crystal, embossing folder, sequins. 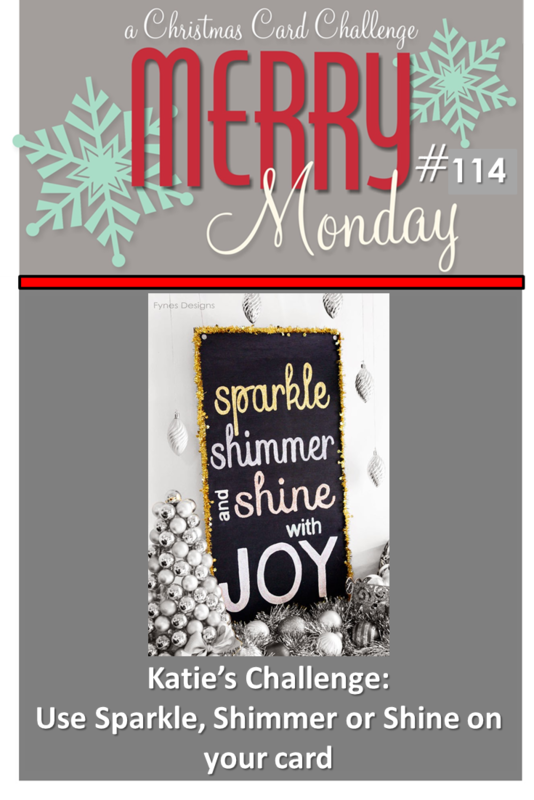 Come play along with us and stop by the Merry Monday Card Challenge blog and take a look at all the great creations by the design team for some inspiration. 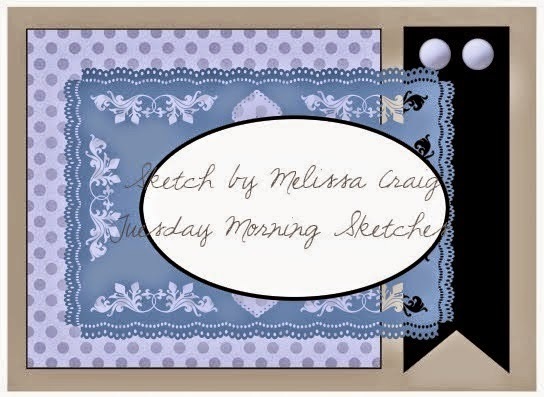 This week flew by and I did not get any cards posted L. I made this card for the current Tuesday Morning Sketches. I had such fun with this card, are you easily distracted ? I know a few people who are and I am away the first to label the activity and darting of into a different direct by calling "Squirrel" so when I saw the stamp sets from Sweet Stamp Shop I could not resist. 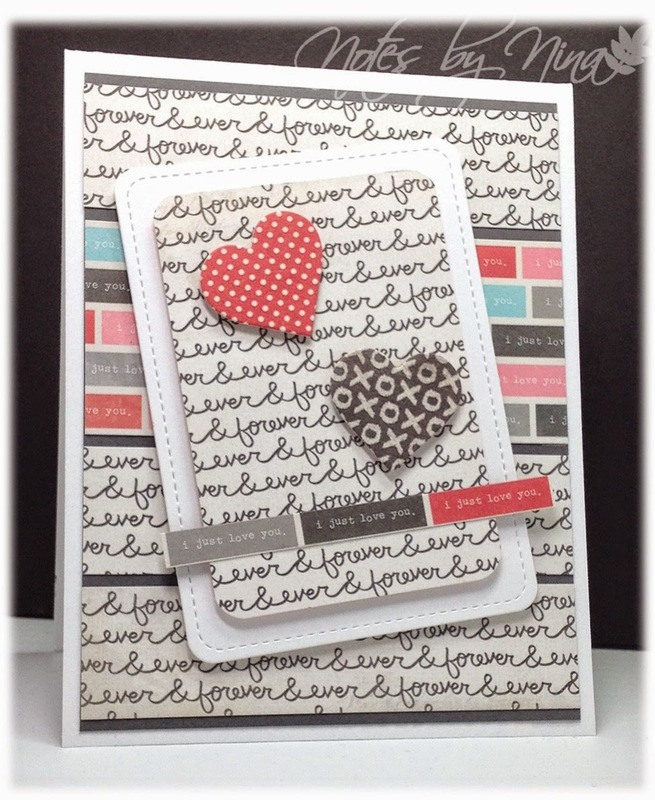 Supplies: White and black card stock, Designer Paper - Teresa Collins, Sweet Stamp Shop-misc sets. Merry Monday, it is time for a new Merry Monday CardChallenge. 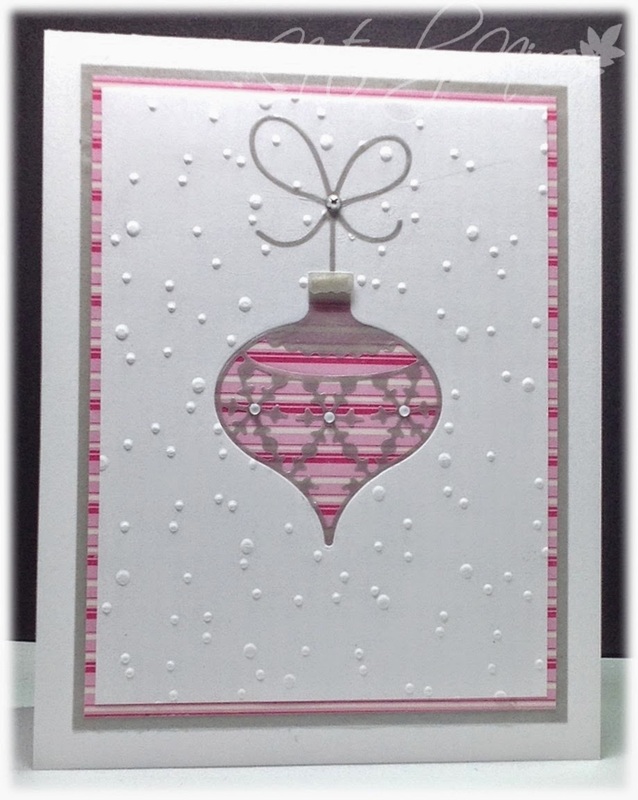 This week Kathy is asking us to Use Pink, White and Silver on your card. I went with a CAS style card with some small layers. I pulled out this pretty Silver Vellum and added a layer of two tone pink DP with some white on it. I used a die cut to add an ornament in the top layer and used the same die cut for the silver ornament. I embossed the top layer with falling snow then finished with clear and silver pearls. I did not want a sentiment on the front but may add one inside at a later date. Supplies: White cardstock, Silver Vellum, Designer Paper – Echo Park, Memory Box die cuts, embossing folder, pearls. I have a huge mess in my craft room right now, all from this card.. sheesh. I needed a get well card for my Mom-in-Law, she is fond of birds so I put together this cute card. I heat embossed the birds on heart DP then fussy cut them out, I did the same with a second set of beaks and popped both up with foam tape. I added some die cut heats and clouds. I created this card for the current Tuesday MorningSketches, I went a little off track with the sketch :) but I wanted to use this picture of my husband taking a selfie with his motorbike. I adjusted the image and put it into a Polaroid then added a small sentiment to it. 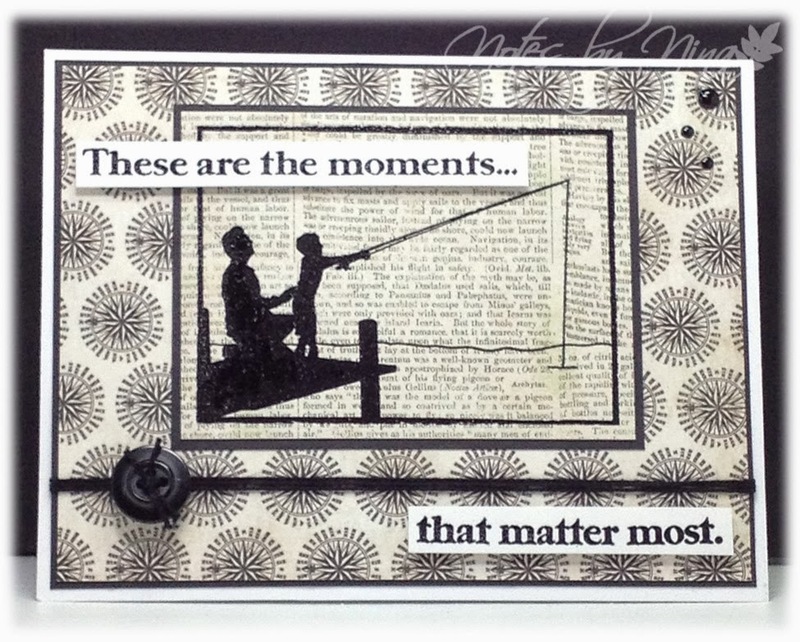 I created layers and used part of the designer paper for the main sentiment. I added twine and the second part of the sentiment. I finished with some enamel dots. 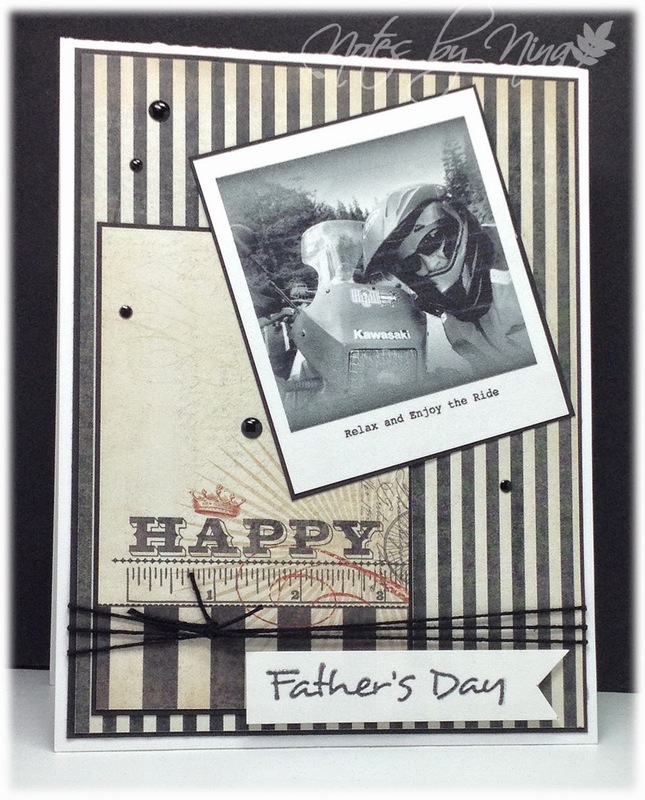 Supplies: White and black card stock, Designer Paper – My Mind’s Eye, Inkadinkado – Father’s Day, enamel dots, twine. I am not sure what Family challenge this is but close to # 11 I think, my sisters Barb has challenged us to try debossing. In the sample video - die cuts are used but I have to admit to just using an embossing folder and using the debossed side. I added a die cut butterfly, a sentiment and sequins. Supplies: Cream card stock, Designer Paper – Echo Park, Paper Smootches and Memory Box die cuts, embossing folder sequins. Take a look at Barb and Judy's blog, to see what they have created. My husband had safely put away the Father’s Day card I made for his dad a couple of months ago, what that really means is that he has no idea where it actually is. So I created another one for him. I stamped this silhouette image on some designer paper then added a black frame, the background is all little compasses which just seemed appropriate. I added some plain black twine and a button as well as some enamel dots. I added a Happy Father’s day sentiment to the inside. Supplies: White and black card stock, Designer Paper – Carta Bella, Technique Tuesday – Gone Fishin’, twine, button, enamel dots. Merry Monday everyone, it is time for a new change for the Merry Monday Christmas card Challenge. This week the challenge is to Feature a Santa hat somewhere on your Christmas card. 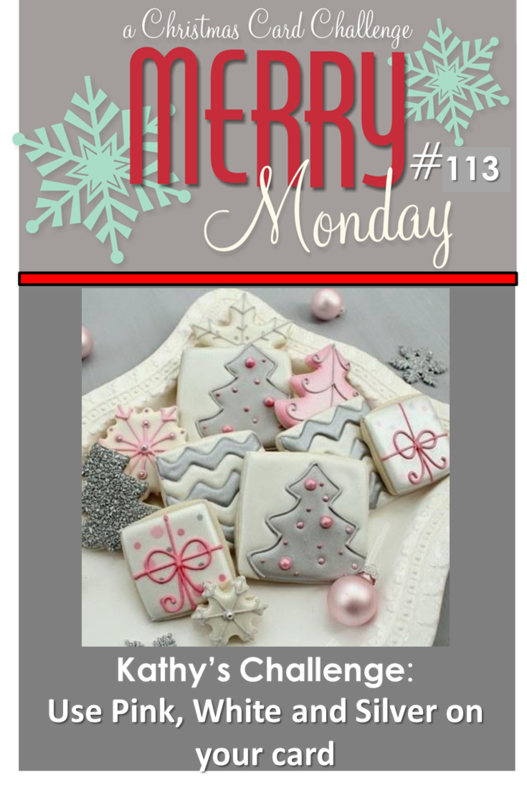 I had fun with this challenge and used my cute Santa hat die cut. 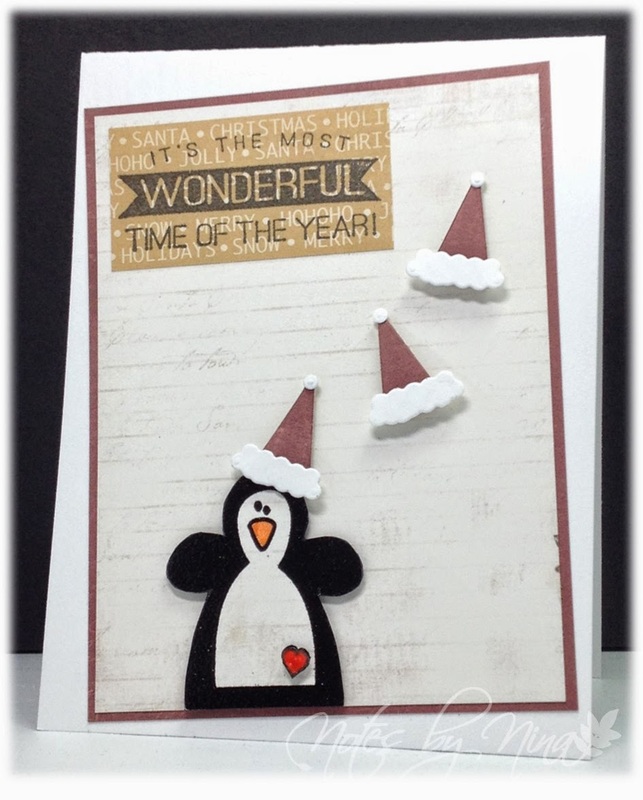 I created a layered panel and offset it, then I heat embossed the penguin then fussy cut him out. I stamped the sentiment on a scrap from the same paper pack, and finally the hats are also made from scraps and popped up with foam tape. 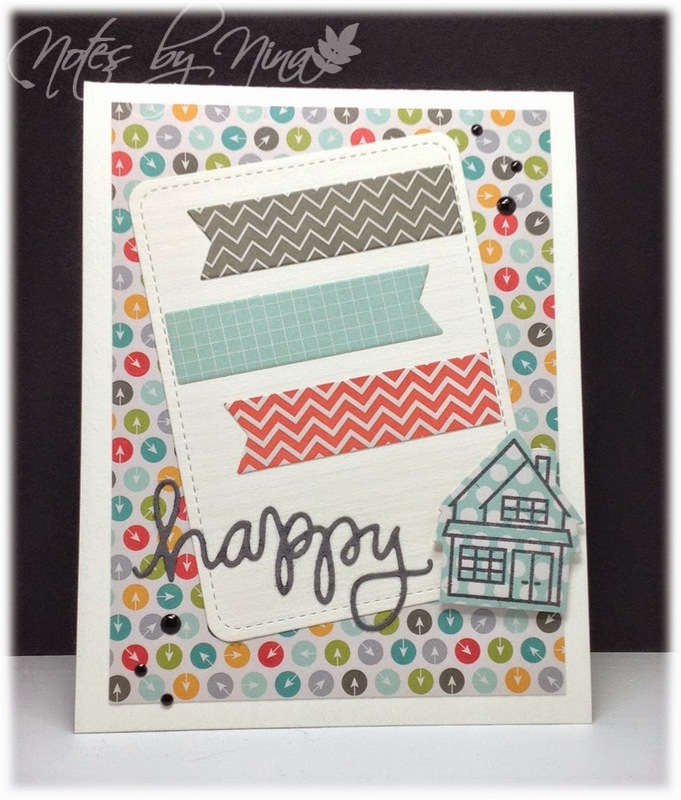 Supplies: White cardstock, Designer Paper - scraps, The Alley ways Stamps, Memory box die cut. I tried to blend two challenges, not so sure if I succeeded or not but it was fun. 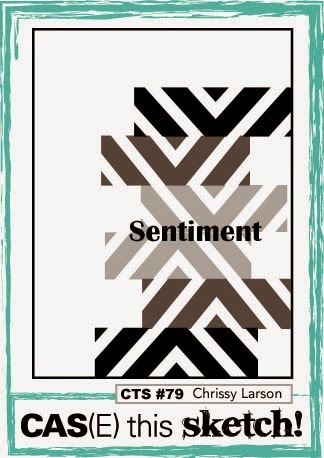 Cas(e): Similar layout but I added my sentiment a little lower in my card. This is a celebration card for a new apartment, I went with fun papers and die cut to put it all together. 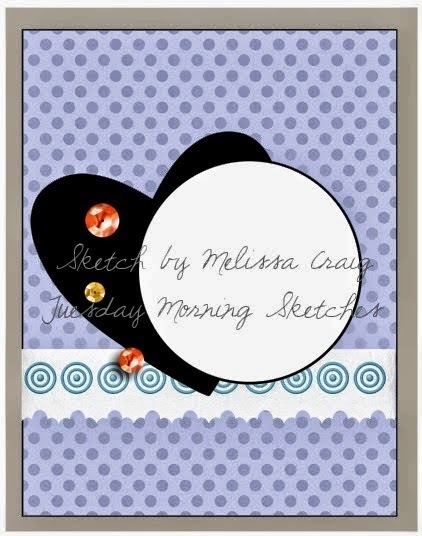 Supplies: White card stock, Designer Paper – Pebbles, Paper Smootches - Bitty Bungelows , Lawn Fawn – Stitched Journaling, enamel dots. I played along with Tuesday Morning Sketches this evening. I turned the sketch and was liberal with my shapes. 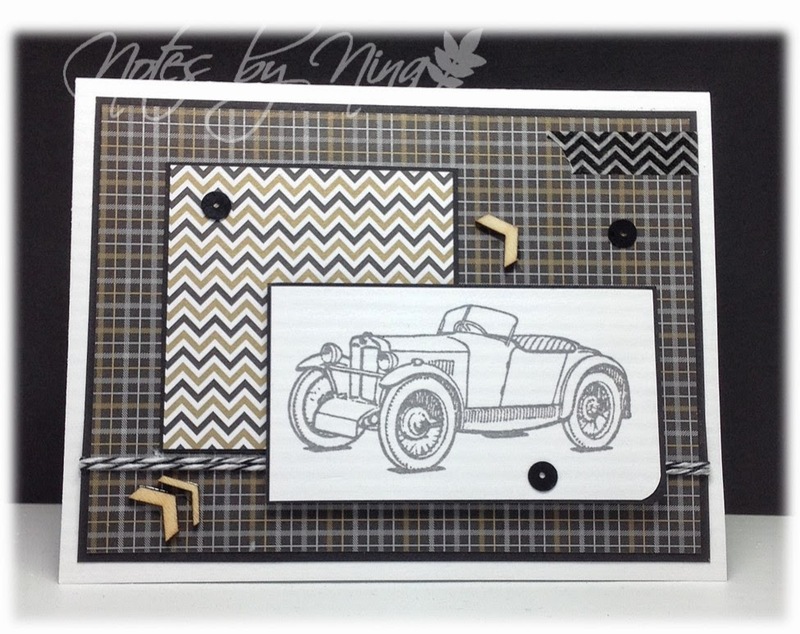 I wanted a sentiment free masculine card so my focal point is the car. I added some twine and matte black sequins, washi tape and some wood pieces. Supplies: White and black card stock, Designer Paper – Doodlebug, The old island stamp company – old midget, wood pieces, sequins, washi tape and twine. I played along with last week’s challenge as well but I was not happy with my card, I looked at it and pondered to long and missed the linky timeline so I will add it to this post as a side note. I made this card using the sketch for the current The Challenge that Lesley has posted on her blog Always Playing with Paper. I seem to keep coming back to this pretty 6x6 paper pack, I guess I am drawn to the fun bright patterns. 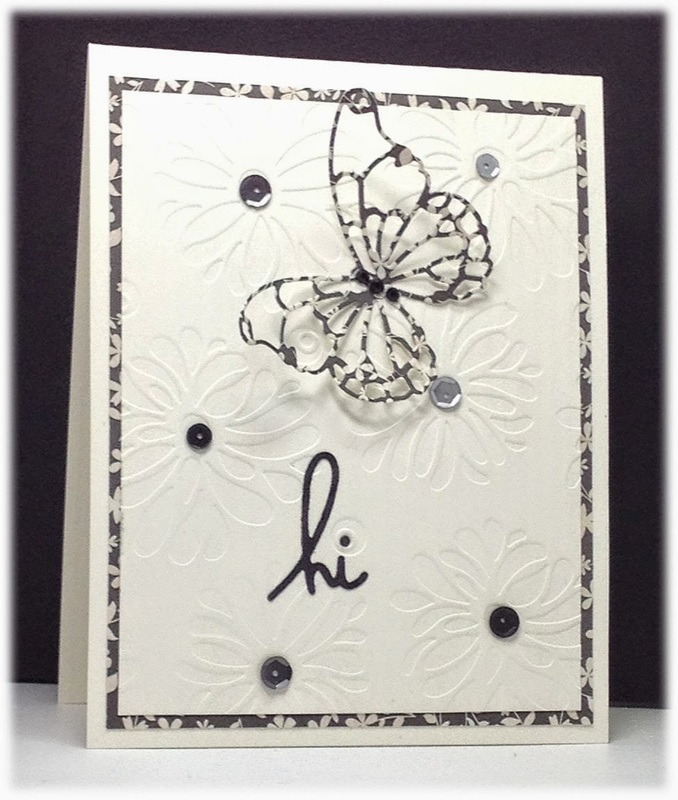 I used some fun die cuts to add little elements like faux stitching, a tag, sentiment as well as the butterfly. I finished with some gem for the butterfly body and some sequins. Supplies: White and black card stock, Designer Paper - Fancy Pants, Lawn Fawn, Paper Smooches and Memory Box die cuts, sequins. I have a second post for today, I connected with my sister and SIL for a little craftiness this evening and we each did our take on the current CAS(E) this Sketch. I have a friend who is going to tackle the upcoming Tough Mudder over in Whistler this month, so this is a cute card I will sent her to wish her luck. I heat embossed on some DP to run along the side of the card, I then heat embossed the little bird on another piece of DP from the same paper pad and fussy cut it out. I popped up the main panel and heat embossed the sentiment. The sequins are an after though and more to hide a few smudges that I always seem to acquire when I work with white card stock. 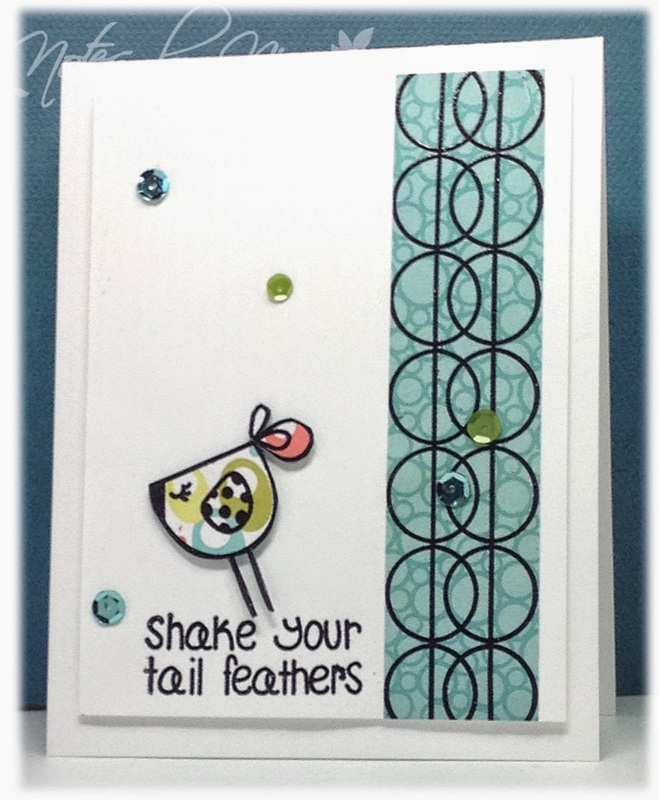 Supplies: White card stock, Designer Paper-Carta Bella, The Alley Way Stamps – Birds of a Feather and Pillow Talk, sequins. Take a look at Barb and Judy’s blog to see what they have created. 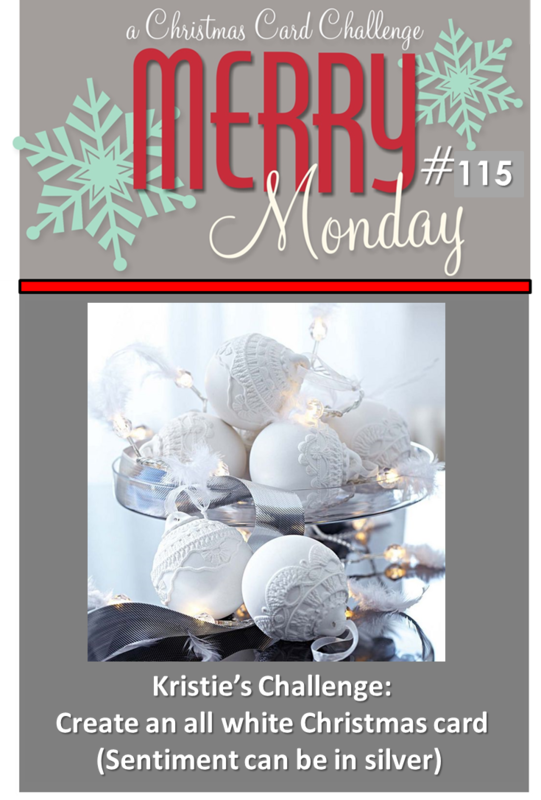 Merry Monday and welcome to June, it is time for a new Challenge for Merry Monday Christmas Card Challenge. 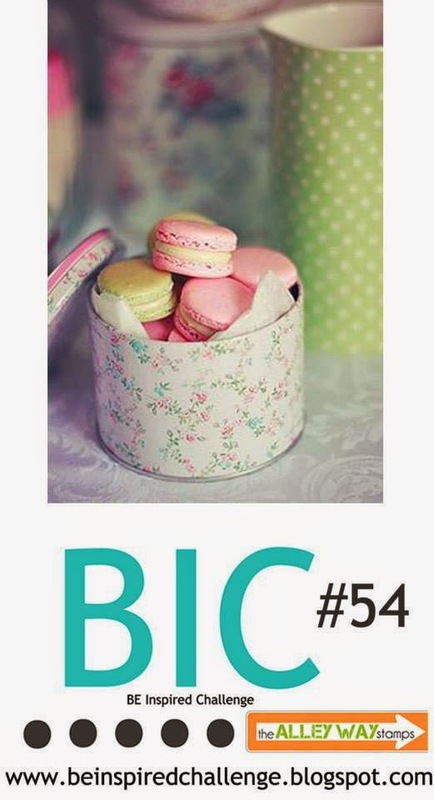 This week Karen is challenging us to Use aqua and white with touches of colour on your card. I cracked open one of (my way too many) 6 x6 paper pads and found this fantastic DP that is perfect for this challenge. I stamped and die cut these adorable little birds and added a touch of colour with my Tombow markers and even added a little orange glitter pen for the beaks. I have them sitting on a little bit of aqua and yellow twine. Supplies: Cream and Aqua card stock, Designer Paper – We R Memory Keepers, Lawn Fawn stamps and die cuts, twine.